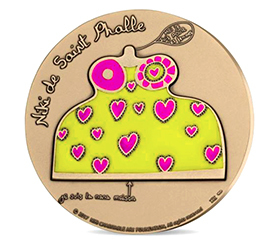 The Niki Charitable Art Foundation gives licenses to selected companies worldwide that wish to produce merchandise related to the art of Niki de Saint Phalle. The Foundation requires close collaboration with multiple steps of approval to ensure quality products. The NCAF does not finance merchandise production. For companies wishing to collaborate with the NCAF on licensed merchandise, please send an email to archives@nikidesaintphalle.org.